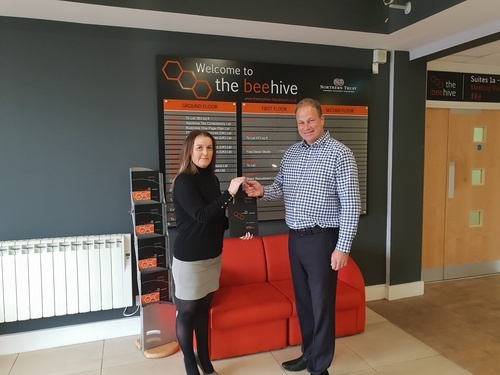 Whittle Jones; agents acting on behalf of Northern Trust Company Ltd are delighted to announce the success of their newly created flexible office space at The Beehive in Blackburn following the letting of Suite 1A to NMCK Ltd on a 3 year lease agreement. The Beehive is a prestigious 3 storey office building which has undergone an extensive upgrade program to provide a range of modern flexible office suites from just 179 sq ft (2 persons upwards). The flexible offices are situated on part of the ground floor and are now occupied by 9 different businesses, including Origin Control Solutions Ltd, Ever Agency Ltd and Business One Page Plan Ltd.
Business One Page Plan Ltd moved into Suite 1C at the beginning of summer. Andrew Botham, Managing Director of Business One Page Plan (Bopp) commented ‘I’m delighted with our new office facilities which provides the perfect setting to expand Bopp over the next few years, especially our Business Growth Club which benefits from the exclusive use of the meeting room facilities for workshop events. When choosing the new location for my business I found that The Beehive’s recently created flexible office space the best in the area, with free WiFi, extensive free parking and professional reception services.” Andrew has invited SME businesses owners to try out Bopp’s business growth club, if you’re interested in learning more please contact Andrew at bopplan.co.uk for further details. Businesses at The Beehive can benefit from a high speed internet connection, a new large break out area, meeting room facilities, 24 hour CCTV security and new reception area. The Beehive is situated next to Elder Court in an established business location adjacent to the beehive roundabout at the entrance to Shadsworth Business Park. With Junction 5 of the M65 in close proximity the office scheme benefits from excellent transport links to the wider motorway network with Preston 13 miles away and Manchester within a 40 minute drive. Located to the south of Blackburn, the town centre is only 2 miles away.